The beauty of life plan community is that you can transition between higher levels of care on one campus. But how does it work? It wasn’t quite the birthday bash Fischer envisioned. She wound up in the emergency room and then having surgery on her hip. After spending nearly a week recovering in the hospital, followed by two weeks in its rehab area, she returned to Windsor to continue receiving care in the community she calls home. But, she didn’t immediately return to her apartment in residential living. Fischer needed additional physical therapy and other help, so she spent several days in Windsor’s rehabilitation and skilled nursing center. Once she was back in residential living, Fischer realized that being at the onsite health center was an easy transition because she wasn’t going to a strange place. Her bird Dulcie, who has since passed away, named for the character Dulcinea in “Man of La Mancha,” didn’t have a difficult transition, either. The sales office staff took care of her, and Fischer reported that Dulcie had a great time and enjoyed the extra attention. How Do Life Plan Communities Work? Like Windsor and other HumanGood communities, life plan communities (also called continuing care retirement communities or CCRCs) offer multiple levels of care on one campus. This care is available for unanticipated life events, like Fischer’s dance party mishap, or other long-term health changes. These levels typically include residential living, assisted living, skilled nursing and memory care. When you first move to a community, the staff works with you to make sure you’re in the right level of care. In many senior living communities, residents pay an entrance fee that is dependent on the size of their unit and the level of care they receive when they move in. If you have a spouse or partner, the entrance fee doesn’t change, but the monthly fee adjusts to cover both of your needs. In a life plan community, you can move temporarily or permanently to another level of care. If you need rehabilitation but plan to return to residential living, like Fischer, your apartment will be waiting. You’ll continue to pay your regular monthly fee and be billed for rehab services, or your insurance will pick up the tab. 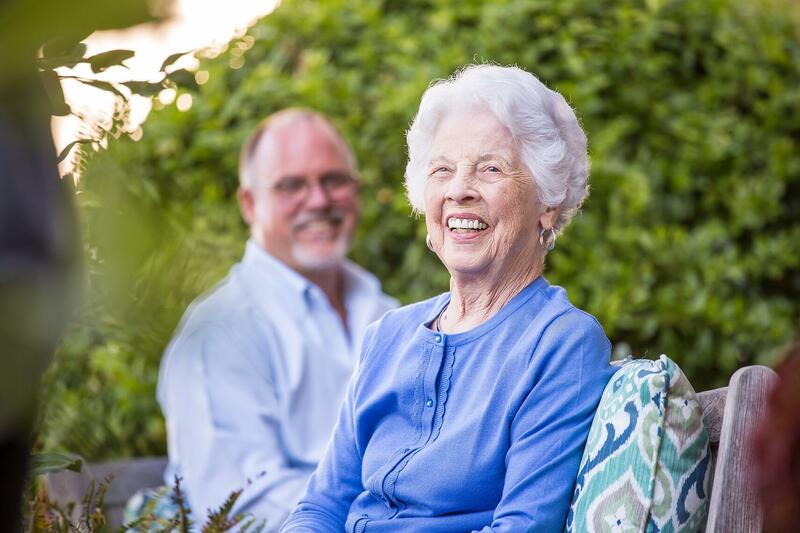 If you or your spouse leave residential living for good, however, and move to assisted living, skilled nursing or memory care, your monthly fee could change to reflect the care you will be receiving. At times, you may need extra help managing medications or with other personal care services, but not need all the specialized care you’d receive in a higher level. In some cases, you can stay in residential living and pay per service for what you need. Every community works slightly differently. At Redwood Terrace, a HumanGood community in Escondido, California, these services are called Support Plus, where residential living residents pay à la carte for extra services they need, whether it’s help with showering, managing medications or getting to and from events. Life plan communities are about far more than just care. Residents become part of a family, building meaningful relationships. Allowing residents to stay in a familiar setting after a health event, with familiar faces nearby, can help make transitions easier. Bob and Jackie Wistort are residents of Redwood Terrace, just five miles from their old home in Rancho Bernardo. While the area is familiar, that’s not why they chose the community. Besides loving the life plan concept, Bob, a retired engineer, wanted a place where he could continue his woodworking hobby. Redwood Terrace allowed him to move some of his equipment to a workshop there. He leaves his apartment every day at 9 a.m. and heads to his home away from home. With the help of power saws, drill presses and other equipment, Bob crafts carvings, cane toppers and bowls. Next, he’ll be working on a rooster. Once, he did experience the benefit of having access to multiple levels of care. Bob had to take a break from woodworking when he fell in the workshop and fractured his hip in two places. The surgery was complicated and he required rigorous rehab after leaving the hospital. The “where” was easy: Rather than having to scramble to find a rehab facility he liked or that had room, living in a life plan community meant Bob could go to Redwood Terrace’s health center, where he was able to access rehab and skilled nursing care. It couldn’t have been any more convenient—the Wistorts’ cottage is just 500 feet from the skilled nursing building. “It was comforting to know that my wife, Jackie, was nearby and she didn’t have to go a long distance to see me,” says Bob. Jackie could visit him at the health center as much as she wanted and was able to bring their beloved six-pound toy poodle, Cookie. Bob says having the multiple levels of care on the same campus make him, and his wife, feel provided for—just in case. Harriet Pearson didn’t have to worry when her late husband needed extra care. As residents of Regents Point, a HumanGood community in Irvine, California, he was able to move between different levels of care on campus, staying at Regents Point’s skilled nursing center, when he was sick. Harriet Pearson also has experience moving between levels of care. Once, she fell and broke a hip. Another time, she was putting away groceries and had placed a six-pack of soda on the floor to unload. When the phone rang, she tripped over the soda. “I have friends who don’t have this opportunity; they worry what they’re going to do if they need different care,” she says. Peace of mind. If your health care needs change, you never have to worry about looking for a new community. Moves are often precipitated by a health emergency. Decisions are sometimes made hastily, without time for due diligence. This can limit your options. Familiarity. You don’t have to start over again in a new community and be uprooted from friends. Familiarity makes a move psychologically easier, making isolation less likely. Clear costs. You know what the costs are at every level, including what you’ll need to spend for extra support. Attention to detail. This could mean help with housekeeping, a dinner you didn’t have to shop for or cook, property that is maintained for you, rides to cultural events or appointments and on-campus activities all planned for you. Priority care. You have precedence over non-life plan residents at assisted living, memory care, rehab and skilled nursing. You know you can get in if you need to, instead of being added to a wait list. Continuing care retirement communities can provide housing and health care on a continuum that changes with the needs of residents.